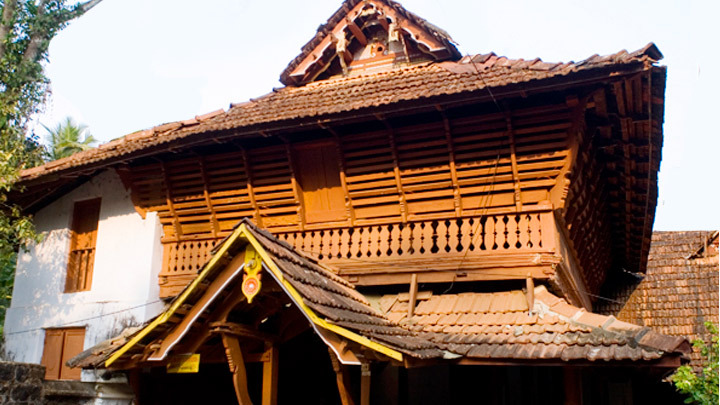 The Poonjar Palace is a glorious testimony to the regal opulence of a bygone era. Within the palace walls is an extraordinary royal collection of antiques and exquisite furniture including a palanquin, a droni (treatment bed) carved out of a single piece of wood for Ayurvedic massages, huge chandeliers, palm leaf engravings, jewel boxes, varieties of lamps, sculptures of Nataraja (the dancing Siva), grain measures, statues and weapons. A unique conch preserved here is taken out once a year for ritualistic purposes. Near the palace is an amazing replica of the Madurai Meenakshi Temple. The walls of this temple bear sculptures that narrate stories from the Puranas (the legends of ancient India). However, the most fascinating thing here is the Chuttuvilakku (row of lamps) carved out on the stone walls of the Sastha Temple nearby. Such rock-cut lamps are rare in India.